The Toy Fox Terrier is sporty and small, with a sprightly personality. TFT's enjoy spending time snuggled on the laps of their people just as much as they love stepping outside for active adventures. Indeed, with their big eyes and ears always on the alert for fun, it's easy to imagine they have the TFT equivalent of FOMO. Toy Fox Terriers have the build of an athlete in miniature, with a sleek, muscular frame and endless energy. They are an American-bred dog developed through the crossbreeding of Smooth Fox Terriers and other toy breeds to hunt for rodents on farms. But their comical natures and boundless energy quickly made them popular as companion dogs and even circus entertainers. Fair warning—this is not a toy breed that will spend hours on end sitting on your lap. They demand a good deal of activity and play from their owners, so be prepared to stay busy if you add a Toy Fox Terrier to your family. After long days spent exploring (and getting into some mischief) the TFT will reclaim their territory on your lap—and in your bed. Toy Fox Terriers are also known as American Toy Terriers, Amertoys, and TFTs. Coat - Toy Fox Terriers have a shiny, smooth coat that is satiny to the touch. The short fur is slightly longer around their ruff. The coat color may be tri-color (white, black, and tan), white, chocolate and tan, white and tan, or white and black. In any color combination, the body is predominantly white, while the head is predominantly the darker color or colors. Toy Fox Terriers are defined by their alert expressions and feisty personalities. They carry their elegant heads high and are graceful in motion. TFTs are square when viewed in profile, equally long as they are high. They are strong-boned without being burly, and they have a lean, muscular build. When meeting the breed standard, the TFT's tail is docked. Their bright, round eyes convey intelligence, and their erect ears are attentive. Toy Fox Terriers are loyal companions, who are always lively, friendly, and confident. The Toy Fox Terrier's closest relative is the larger Smooth Fox Terrier, a breed developed for fox hunting in England centuries ago. American breeders of Smooth Fox Terriers created their diminutive cousins to put their hunting skills to work controlling rodent populations. 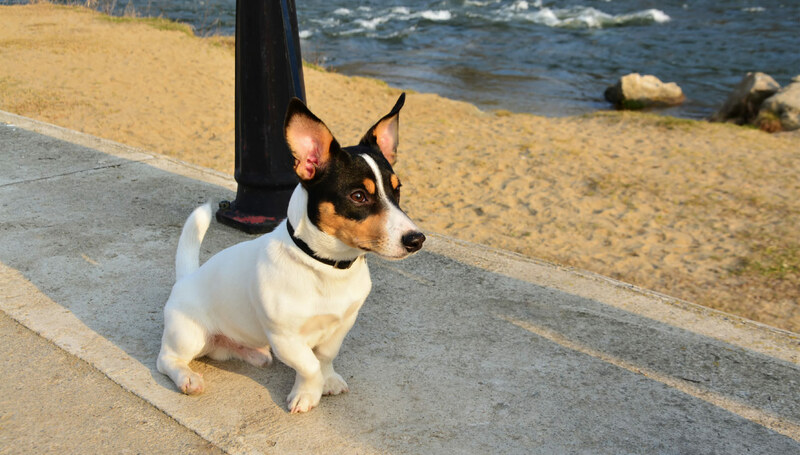 To create TFTs, the runts of Smooth Fox Terrier litters were crossbred with Chihuahuas and Italian Greyhounds, among other toy breeds. Today's TFT combines the athleticism, agility, and tenacity of his ancestors. Toy Fox Terriers were officially recognized by the AKC in 2003. Living with a Toy Fox Terrier can be a head-spinning experience. One moment your TFT is sitting with you, like the most pampered lap dog, and the next they are racing around the yard with a case of the zoomies. They are highly sociable with their families, and somewhat aloof when meeting strangers. TFTs have a clownish, mischievous quality and adore being the center of attention. Are Toy Fox Terriers Good with Kids? Toy Fox Terriers are best in households with older children who understand how to treat dogs gently and respect their space. Young kids can unintentionally injure TFTs when they play too rambunctiously. Are Toy Fox Terriers Good with Other Pets? Toy Fox Terriers make peaceful companions for cats and sometimes the two species even develop a strong friendship. TFTs may be friendly around dogs with whom they were raised, but they can also be combative with other dogs. Toy Fox Terriers are protective of their territory. Are Toy Fox Terriers Good Guard Dogs? TFTs will alert the household when people approach, and their bark is impressive for their size. Though they'll put up a brave fight against interlopers, these teeny dogs can't be expected to fend off would-be intruders. Toy Fox Terriers are exuberant for much of the day, but they settle down for snuggles now and then. They require a lot of attention and exercise. A TFT will rule the roost, if allowed; socialization and training are important so your TFT understand the rules of the house. Digging is in their nature. They are prone to wanderlust, especially if they see birds to chase outside of the yard. Make sure enclosures are secure and you always walk your TFT on leash. They may be combative with strange dogs much larger than themselves; train your TFT to show respect at the dog park. They're not ideal for households with young children. The TFT is prone to broken bones when jumping from heights. Indoor Toy Fox Terriers deserve the comforts of home, as much as any two-legged member of the family. They are energetic and entertaining housemates who often draw attention with their antics. Fur doesn't pile up with the TFT because they are so small and shed only lightly. Outdoor TFTs enjoy outdoor adventures, but they don't require yard space. If you do have a back yard, be sure it is fully enclosed or your Toy Fox Terrier will find a way to escape. Because this breed will dig, it's helpful to designate a corner of the yard where digging is allowed. Exercise A healthy Toy Fox Terrier requires about an hour of daily physical activity to remain fit and calm. This breed is a wizard at most dog sports, and agility courses. Endurance TFTs have the stamina for long play sessions, after which they'll want to rest. It doesn't take long before they are fully recharged. Running Miles: TFTs are too small to be your distance running buddy. But a healthy, adult Toy Fox Terrier can jog with you for a mile. Hiking Miles: Toy Fox Terriers are game to hike with you on the easy trail. Food Generally, this breed requires about ¼ to ½ cup of good quality dry dog food each day, given in two feedings. This will vary, however, based upon your TFT's activity level and age. Talk to your veterinarian about the optimal diet and quantity of food for your Toy Fox Terrier. Alone Time Even if you could close the door between you and those big, searching eyes, you aren't going to want to leave your TFT alone for long. Toy Fox Terriers don't like spending time alone, and they develop nuisance habits, such as digging, chewing, and barking, to cope with their solitude. With patient training, you can leave your TFT alone to run a few errands. Save your furniture by crate training them and leaving them with a puzzle toy to enjoy while you're out. Though they can be a handful to live with, Toy Fox Terriers give you a break on their coat care. Their short coats need only a weekly brushing, and a wash every month or so to stay silky and pleasant smelling. Wash your TFT's ears weekly with a gentle, dog-friendly cleanser to prevent dirt buildup that can cause infections. Brush your Toy Fox Terrier's teeth several days a week, and trim their nails every month or so to prevent painful cracking. You can minimize serious health concerns in a Toy Fox Terrier by purchasing from a reputable breeder who engages in responsible breeding practices, and through screening for common diseases and conditions. TFTs are smart enough to learn the basic commands quickly—they just may not be interested in paying attention. Because they are stubborn, you'll get the best results if you keep training sessions entertaining and offer an abundance of positive reinforcement and praise. With their combination of intelligence, energy, and athleticism, Toy Fox Terriers are excellent candidates for advanced obedience, dog sports, and agility training. Are Toy Fox Terriers hypoallergenic? No. Toy Fox Terriers have a double coat that sheds and, as a result, leaves pet dander in your home. Pet dander is the primary cause of pet related allergies. As a toy breed, they naturally have less fur to shed, however, which could result in fewer symptoms among some allergy sufferers. Are Toy Fox Terriers and Rat Terriers the same? No. Though similar in appearance and their early roles as ratters, they are two distinct breeds. Rat Terriers are slightly larger dogs, and are categorized in the Terrier Group. Can Toy Fox Terriers swim? Yes. Toy Fox Terriers can learn to swim and some enjoy going in the water. Each dog has unique likes and dislikes, however, so don't push the issue if your TFT resists swimming. If your Toy Fox Terrier enjoys swimming, keep their time in the water short because their small, lean bodies lose heat fast.